Back when we headed off on our sixteen day adventure through Europe, I had no idea what was in store. When we returned, people were always asking us which place was our favorite. Of course this question was super hard to answer, because there was gorgeous and amazing Ireland, as well as the modern city of London, but then....Italy. Oh Italy, you truly were my favorite. And you know what city blew me away much more than I expected it to? Venice. 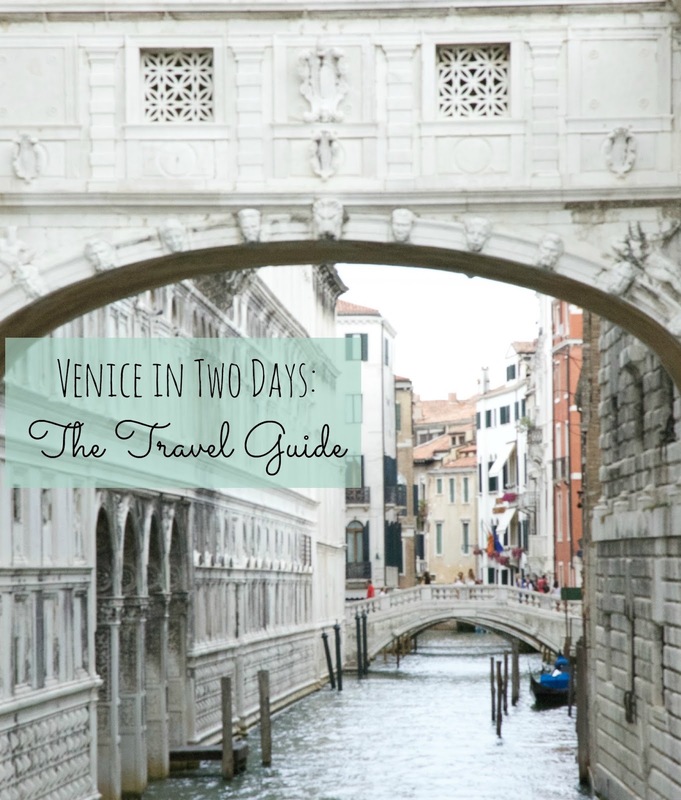 So here it is friends, the guide to travel, hotels, and attractions in Venice! There are several different ways to start your trip in Venice. We came in on a train from Geneva (which offered some of the most beautiful views of Italy that you could ever see). The train is the best way to enter the city, because it's cheap. If you try to drive, you'll end up paying decent money to park a car, which you can't drive around the city anyways, since no cars are allowed. (I wouldn't even mess with a car in Italy, unless you're renting a Vespa to drive the Tuscan countryside.) Eventually you will have to take a train, bus, or ferry anyways to get into the actual city of Venice, so I recommend taking the train from elsewhere in Italy or Europe if at all possible. I booked everything through Trenitalia instead of Rail Europe, and it was a lot cheaper. Just make sure you switch the website to English! When you're booking your train, make sure that your final destination is Venezia Santa Lucia, and not Venezia Mestre. The Mestre stop is not actually on the island yet, and is more like a suburb. If you fly, you'll go into Marco Polo Airport. We didn't use this airport, but it's a decent ways north and east of Venice. If you do fly in (as it's your first stop in Italy), you'll be able to take either a water bus (which will take about an hour), or a shuttle bus (20-25 min). Look at the pricing carefully, as the public water buses are much much cheaper than private ferries. You can also take a bus to the train station and come in that way. Since Venice doesn't allow cars (and has the tiniest little "street" alleyways you ever did see), inner-city transportation obviously looks a little different. 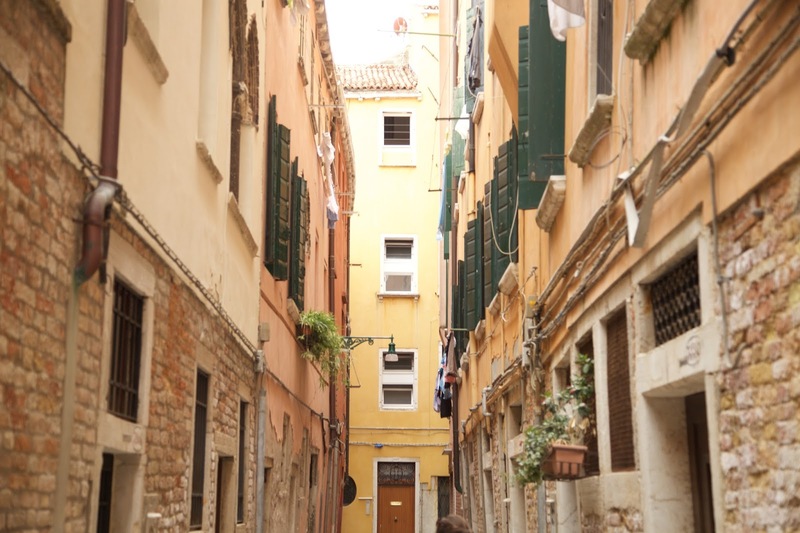 Yes, you could walk everywhere in Venice if you wanted. 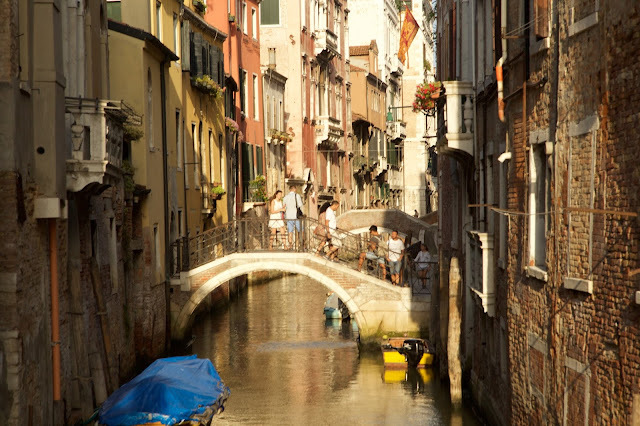 But because there are 177 canals in Venice, there are also 177 bridges, and reaching those bridges may mean you're walking wayyyy out of your way! The answer to this problem? The unlimited transportation passes for buses and waterbuses. Depending on your length of stay, you'll want to pick up a 1, 2, 3, or 7 day pass from the Venezia Unica website, or right there from the booth once you reach Venice (they are right outside the train station). Some passes are "all-inclusive", and can also include transport to and from the airport if you need that! If you're between the ages of 6 and 29, you're in luck! Get the Rolling Venice Card for 6 euros, and then your transportation passes become much cheaper! We got the three day youth pass, which was 22 euros with the purchase of the Rolling Venice pass, instead of 40 euros. So a grand total of 28 euros (about $31 a person), got us around the city for our entire stay. If you're coming from the airport, you can get a three day pass plus round trip transfer for only 34 euros. Basically, if you're under 29, you've GOT to get the Rolling Venice pass! Also, be sure to pick up a map. Street names are literally on the side of the buildings, and navigating Venice can be confusing sometimes. Be sure to get the CityMaps2Go app so you can navigate offline with your phone. 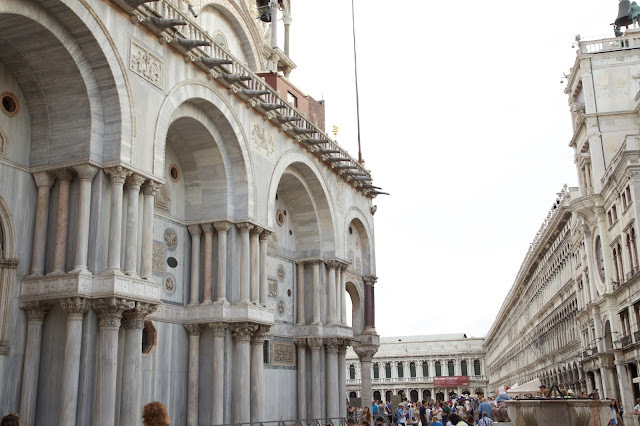 Many Venice sights are free, which is a major perk! As recommended in my post How to Plan (and Survive) and Overseas Trip, we started off our visit with a tour. This one was a free walking tour that took about two hours. It was fabulous and we really got a feel for Venice (and tipped at the end to show our appreciation). The city is kind of hard to navigate at first, so the tour really helped. Once you've got your travel passes, you're all set to take the Vaparetto (or public water buses) around the city. Since you've already paid for them, why not take a free "Grand Canal Cruise"? Instead of paying lots of money for a gondola ride, download your Rick Steve's Audio Tour App, then read or listen to the information, offered in the order of the stops on the canal. I even had a printed version that I read aloud to my hubby and our travel buddies. It helped so much to know what we were seeing (and it was free and interesting)! One can't miss area is the Piazza San Marco (or St. Mark's Square), which is the home of the famous Doge's Palace and St. Mark's Basilica. We didn't go inside Doge's Palace, but it was beautiful from the outside. We did go in St. Mark's Basilica, which I would highly recommend- and be sure to reserve ahead of time so you won't have to wait in line at all. The reservation only cost four euros and was so worth it, but just visiting is free. They are very strict on their dress code, which requires no bare shoulders or knees. I wore a knee length dress and just wrapped a scarf around my shoulders for the visit. Guys got away with long shorts. 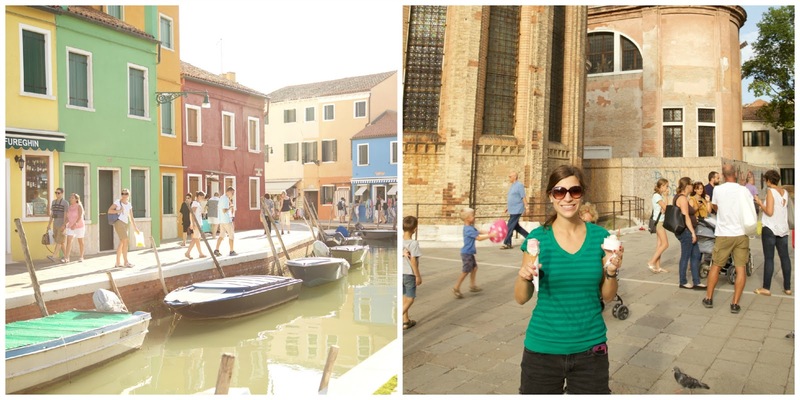 Honestly, we paid hardly anything for our sightseeing here, and instead chose to use our Travel Passes to go all around the Island, as well as out to Lido (which has a beach), Burano, and Murano, which are other small islands you can also visit for free with your pass! 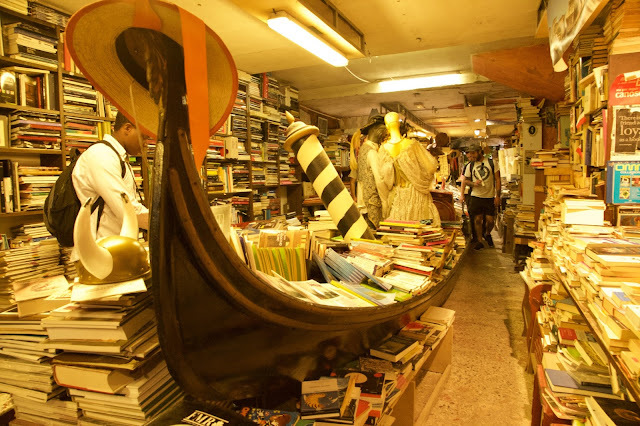 My friend Teresa and I let the boys head back to the famous Libreria Aqua Alta bookshop, and then we headed off on Rick Steve's recommended Lagoon Cruise. Murano is the first island out, famous for its handmade glass (which isn't blown in July when we were there). Burano is farther out (about 30 min), but its big draws are lace and colored houses. Teresa and I got some lovely scarves here with hand-made lace on the end. I'm so thankful we got to see these other islands. So beautiful! We found a Best Rate Guarantee on a cute little Bed and Breakfast in Venice, the Al Saor. Our room was cute and cozy with a private bath and free breakfast. It was in an easy to find, quiet location, complete with laundry hanging across the way and the true feel of Italy. Best of all, with our BRG discount, we only paid $50 a night. 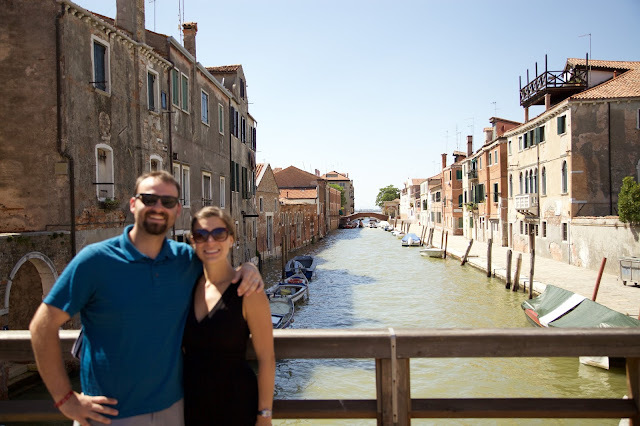 If you've got Hilton Points or don't mind splurging, our friends stayed at the Hilton Molino Stucky in Venice and it was gorgeous with amazing poolside views. They also have a shuttle that takes you across to the heart of Venice. All in all, Venice was absolutely amazing. The food was delicious, the views were gorgeous, and it truly felt like we were in a whole different world. I loved the ease and slower pace of the city, with no loud cars or crowds. There were definitely other people there, but the temperature was literally perfect, and we didn't find the crowds to be annoying or overwhelming like all the internet research had warned us of (though it was the end of July). I loved Venice, and would definitely go back again. What are you waiting for? Start planning your trip to Venice- you won't regret it! Contact me here or comment below if you need any help or have any questions! For other tips on how to travel cheaply and effectively (as well as what you should see along the way), check out the travel tips and using points sections of the blog! I love Venice! When I was backpacking Italy I also had two days in Venice. I found that walking the city was the best way to see I good amount. Thanks for the information! People had warned me it would be stinky and crowded...but I didn't really notice either. We walked SO MUCH in Italy! The vaparettos were really nice late at night if we were on the other side of the island (or exploring the other islands). Loving getting "lost" walking up and down alleys! Thanks so much, Rosalyn! We loved taking photos there. The free walking tour was great!! Thanks for reading, and let me know if you have questions when the times comes. Wow! The place is awesome, I hope our plan of coming there will pursue. Thanks for the awesome post. It was literally amazing!! I hope you can make it there too. Thanks for stopping by! This looks amazing! 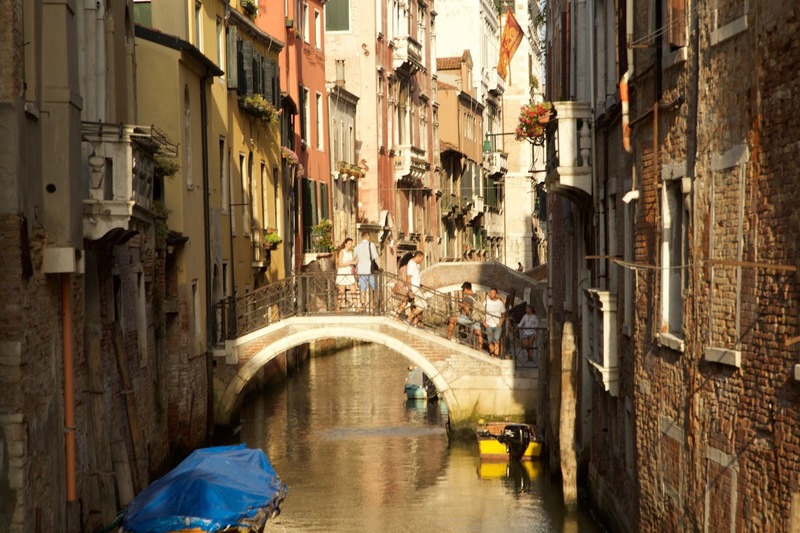 Venice has always been on my bucket list - hopefully I'll be able to visit sooner rather than later! Oh, Venice is so worth a visit!! I thought it would be my least favorite in Italy, but it was awesome! Italy! Now you're speaking my language. Maybe I'll just keep accumulating Hilton points with the intention of using them in Venice. I'm so glad y'all had such a great trip! Do it, Abby! You won't regret it! The hotel there was amazing (we checked it out with our friends!). It was so wonderful (and Italy was my favorite). 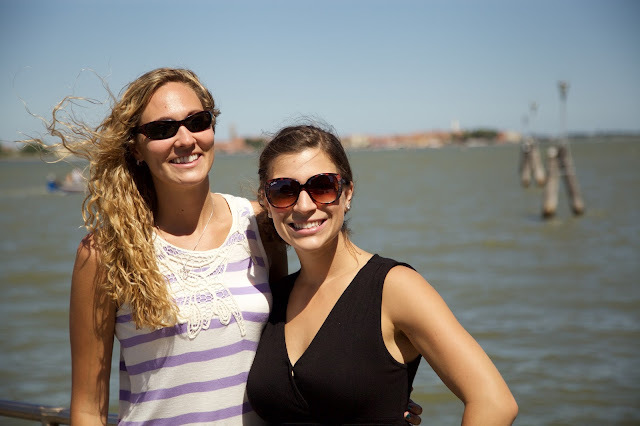 we missed the free walking tour in Venice, but we got to do most of the other things you mentioned! That's awesome, Diana! I really loved the visit. So different and fun! Venice looks absolutely beautiful! It's at the top of my travel bucket list. I'd love to see all of Italy, actually. I'm hoping to go sometime in the next couple years! It IS so beautiful! Italy is my favorite country (followed closely by Ireland). You should definitely make a trip! You are so right, Joanna. It's just so unlike any other city! Oh how fun is that? You're right, it is touristy and there aren't a ton of locals, but it's so worth the visit. I love the when the Basilica glows gold if you visit at the right time! Venice looks so beautiful! I've always wanted to go. I'll definitely be saving this post in the hopes that I get there someday! I'd love to go to Venice someday! Thanks for all the tips and beautiful photos. Oh yes, it definitely lives up to its photos! Thanks so much for reading! Oh this post made me homesick! I lived in Italy for 3 years, when my two oldest were babies. *Sniff* We used to go to the top of Doge's Palace to watch the Carnivale parade. Now I'm craving a toast. Found ya from the #Monday'sMusings linkup. Have a wonderfully blessed day! Oh wow, how fun is that?? So fun that you can remember living there and visiting. Thanks so much for your kind words and for stopping by. Oh the wonderful memories!!!! Such an awesome experience.... not only Venice, but Venice with friends!!!! Thank you again & again for your wonderful shared-outloud guides! They definitely added much info & character to the trip!! I loved going on the island tour with you!!! I laugh everytime i think of our water bus ride home experience, and running through the stop to make it on the last one out of Lido!!!! We still need to swap photos.... you guys coming back to SD anytime soon?!?!?! So wonderful, aren't they? I keep finding myself remembering things here and there- Italy (and all of the trip) was so wonderful! Remember that amazing dinner place? I can't remember the name of it, but it was awesome! I LOVED the tour with you- thanks for being adventurous with me! Oh the water bus haha- I totally forgot we were running! Hmm...we will be home until February. Coming back to KC soon? Love this post! I find Venice so romantic! Would love to visit this place someday! Loved the pictures!! Thanks so much, Tayrina! You should definitely visit- it's gorgeous! So beautiful.... was in Italy mostly Rome over 30 years ago... would love to go back! You have captured the beauty with the pretty pics! Thanks Clare! Rome is great too (and I'm posting my guide to Rome soon!) Thanks for your kind words- taking pictures there was a blast!! Oh my heavens, you make me want to hop on a plane and go to Italia! Italy is really high on our list of places to go next and I'm so bummed we didn't have time for it on our trip last summer. We need to plan a trip like this soon so we can eat all the spaghetti and drink all the wine. :) Thanks for sharing these tips! I have always wanted to go to Venice! Beautiful! Venice is seriously amazing! It kinda knocked my socks off. Thanks for reading!! Thanks so much Carmen, you should totally plan a trip. I'd love to be your tour guide/travel agent :) Thanks for stopping by! One of my all-time travel goals! Thanks for the pictures and the advice to do it on the cheap!! Thanks for all the advice. Looks like you had a good time! You are so welcome, Cori! We had an absolute blast! Thanks for reading. This is definitely perfect! I am planning on going to italy in the near future, and venice is definitely on the top of my list of must go places while I'm there! Thanks for this! Italy is SO great- you will love it Mayara. Hope you can make Venice work for sure- it's amazing!! I absolutely love Venice. It's one of my favorite cities. I love your tips and your pictures are giving me a serious case of wanderlust. Haha. Thanks for sharing! Haha, thanks so much, Autumn. My own pics are giving me a case of nostalgia and trip fever :) Venice was so so great. Thanks for reading! I so hope I get to go to Italy someday! Oh you should, Abby! It's so beautiful! The photos are beautiful!! I have always wanted to go to Italy and find it so interesting that cars aren't allowed in Venice!! 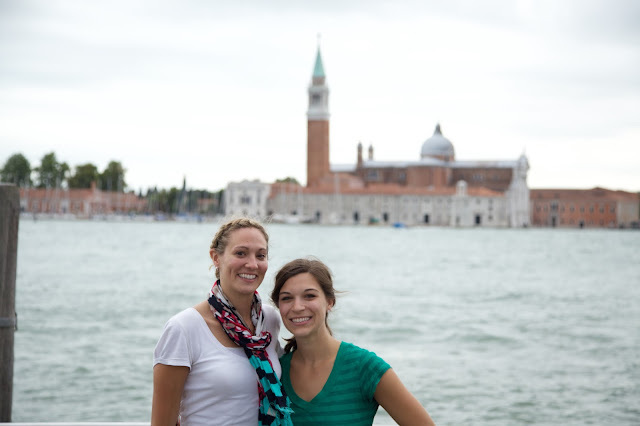 Thanks for the great tips on visiting Venice. I visited Venice a few years ago. I recommend eating and shopping in the back streets of Venice. The food is over priced around the popular tourist attractions. You're so welcome, Marla! Thanks for reading. You are right, some of it is over-priced for sure! Wow first of all your pictures are so beautiful! I have yet to travel to Europe so guides like this make me want to go even more, and now I know a little more about it (your transportation tips were very helpful). I think I'd like the gelato too ;) Thanks for linking up at Welcome Home Wednesday! Love this ! And all the amzing pic I have never flown bit when i do this is where ! Thanks so much for coming by Welcome Home Wednesdays. Venice looks so beautiful! I would go to watch all the architecture. What an amazing time! Riding in a gondola in Venice is on my bucket list! This is an amazing post!!!! I really want to go, and I didn't know about the no cars!! I'm under 29 so I will take advantage of that pass.